The Republican Party presidential front-runner Donald Trump cancelled his scheduled rally Friday night at the University of Illinois-Chicago (UIC), west of downtown Chicago, as violence and scuffles broke out inside. Thousands of students and workers in the area marched outside the UIC arena to protest Trump’s attendance at the campus, denouncing his extreme right-wing and fascistic political views. 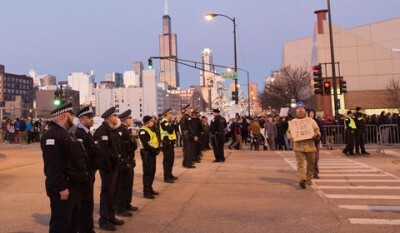 Protesters marched from the campus quadrangle along a heavily-barricaded protest route to the UIC Pavilion with a large police and security presence. The protests outside were entirely peaceful. In canceling the event, Trump’s team cited security concerns over growing protests outside the arena and the highly volatile situation inside. After doors were opened at 3:00 p.m., protesters who attended the rally entered into scuffles and altercations with the rally participants as well as with security. Prior to the cancellation, Trump’s announcers initially encouraged conflict by telling attendees to inform police of protesters by placing a rally sign over their head and chanting “Trump, Trump, Trump,” according to NBC’s Chicago affiliate. The events in Chicago followed several incidents of violence directed at protesters from Trump supporters and security, encouraged by the candidate. This included an incident on Wednesday in which a protester was punched in the face as he was escorted out of a rally in North Carolina by police. Trump on numerous occasions has encouraged his supporters to “knock the crap out of” protesters. The anti-Trump rally was attended by many thousands of workers and particularly young people of all races and ethnicities. It was originally organized on Facebook by an undocumented UIC graduate student, Jorge Mena Robles. Robles is a member of a newly formed political organization called Mijente, which promotes Latino identity politics and voter mobilization for the Democratic Party. Support for the demonstration, however, was not limited to such forces. Over 11,000 responded to the Facebook event page by Friday. Citing the incidents of violence at Trump rallies across the country, UIC students and faculty denounced the administration and Chancellor Michael Amiridis for allowing Trump to host his campaign event on the campus. Amiridis responded to the anger of students and faculty by saying, on the grounds of “free speech,” that Trump had every right to rent a space at UIC. Similar considerations have not prevented the administration from placing enormous obstacles on the promotion of socialist politics on campus. Reporters from the World Socialist Web Site spoke to students, workers and professionals who attended the protest against the Trump rally. “It really frustrates me that Trump is on the platform,” said Tim, a professional who came to see the protests. “He’s channelling the frustrations of many people and taking it to a really scary place. As far as Sanders, I like what he is saying. A big reason why I am pro-Sanders, at least among the candidates that can be elected, is because he’s called himself a socialist. I think capitalism is a flawed system and I agree with socialism in general, but I’m not sure if the United States is unified enough right now for that. “His policies are incoherent. I am here more to protest the fact that UIC is even hosting Trump. We have an incredibly diverse student body and it’s a completely inappropriate place for a Trump rally. He’s condoned violence at his rallies before. “Trump is also calling for torture, which is an open secret of American politics now. We have an ostensibly democratic system that doesn’t in fact represent people, with our crony capitalism and the outsized power of money and lobbyists. Look at the closure of Chicago State University. We don’t have money for schools in Chicago, but if one of [Mayor Rahm Emanuel’s] buddies wants something, they have the money for it. Even Obama was not as liberal as he claimed to be. He was an idealized candidate.